During my parent’s visit two weeks ago, we were able to squeeze in two lunches in the city. The first was on Thursday, when they arrived via train and came into Back Bay Station. I had parked in my “secret parking spot” (off Berkley Street, by the Chandler Inn)… so what better place to chow down than Myer’s + Chang? I had only been once before… and LOVED it… so I was looking for any excuse to go back. It was a nice walk and a beautiful day — and, we got to take a peek at the Boston community gardens on the way there… trying to guess what the various greens were (both me and my dad are avid gardeners). Some looked just like Elephant Ears. We didn’t realize this was edible… and it seemed like a lot of people were growing it. We seriously doubted it was “just for looks” — especially considering the majority of the garden purveyors are Chinese immigrants. So I decided to look it up and I learned something new. The plant foliage known as Elephant Ear, that we grow as a seasonal ornamental… is actually Taro root!!!! I had NO idea. You learn something new everyday. Now I’m wondering if it’s cheaper to buy the bulbs from a gardening store or to just pick them up at the grocery store?? In any case, we arrived at M + C right when they opened for lunch… 11:30am. We were the first ones there and pretty much had the place to ourselves for most of our visit. We ordered a few beers ($6 each) and I got an Asian Mojito ($12), which was very good — basically a mojito, but with sake rather than rum. 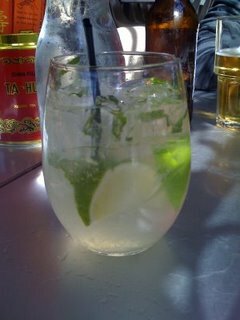 It was a healthy portion, a decent pour and very refreshing. 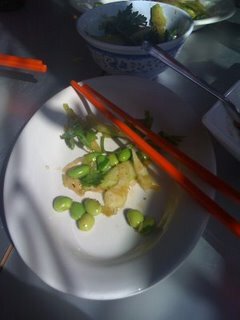 I also placed one dim sum order — the Edamame and Celery Slaw — with sesame oil & candied lemon ($4). This is one of my favorite things on the menu. It’s light, crunchy, savory, sour and nutty all rolled into one. I love the combination of celery, sesame oil and candied lemon peel… just watch out for the larger pieces of parsley… they can obstruct the simplicity of the dish with an herbal punch. 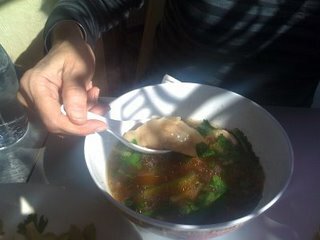 For lunch, my mom went with Chicken and Rice Soup — with pork dumpling & baby bok choy ($11). She thought it was ‘okay’. It wasn’t what she expected and the portion was small for the price. With no visible pieces of chicken, very little rice and a rather bland broth, this dish was a bit of a disappointment. 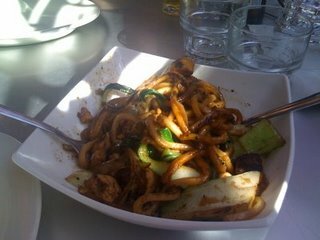 I couldn’t resist getting the same dish as last time — the Vegetarian Wok-charred Udon Noodles — with tofu & baby bok choy ($11 ). I just love this dish. The noodles are smokey, savory, salty and pungent. I love the sauce and the flavor-saturated tofu. I definitely recommend this dish… and it comes in a chicken version as well. 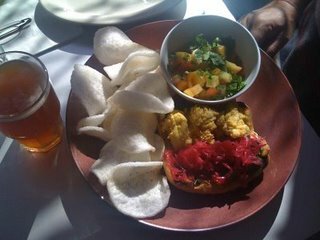 All-in-all, an excellent lunch at very affordable prices. As I probably said last time… if you haven’t been to this place yet — you must go! You’ll love the kitchy–ness of the decor, the background music and the funky staff… not to mention the aromas wafting from the open kitchen. This is definitely a SoWa keeper.